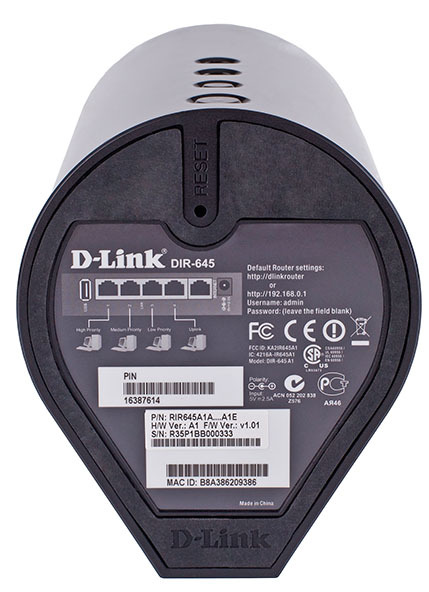 When the wireless router D-Link DIR-645 appeared in our lab it was long before we were rid of a feeling of something old and nice – it looked very much like a coffee-grinder or a thermos or even an electric kettle without a handle and a spout. Only D-Link spelt on the side returned us back to reality. So, we’re presenting to the reader a review of a device whose appearance aroused so many positive memories. DIR-645 is performed in a shiny black plastic case whose dimensions are 117*190*97 mm. For its work the device requires a 5 W and 2.5 A external power adapter. The upper lid is quite featureless; it only has a round technological ventilation hole. 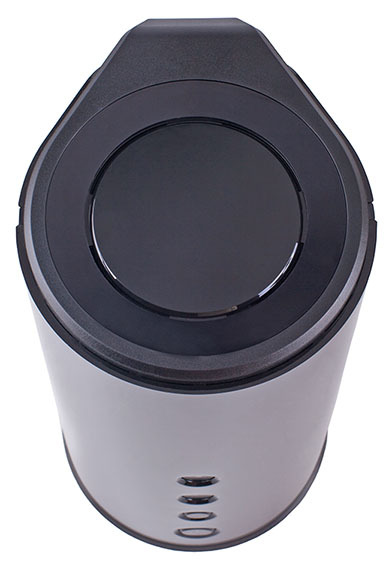 On the bottom of the device there is a big rubber stand, a sunk Reset button for resetting user configurations as well as a sticker with brief information about the model. It has to be noted that signs explaining to the users what each interface is intended for are rather confusing. According to these signs, the LAN4 interface is for connecting to Uplink, though in our view the uplink must be connected to the INTERNET interface. 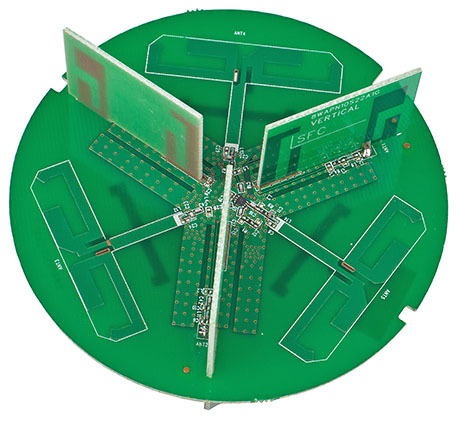 It’s difficult to see where the front panel ends and the side walls begin, so we’ll note that on the front there’re four LEDs (Internet, Wireless, WPS and Power) indicating the parameters of the device operation. Two of them are also buttons. The way the power on/off button is implemented didn’t seem to be the best: firstly its size and travel depth make it difficult for thick men’s fingers to press it; secondly, when pressed hard, the button can get a bit stuck. On the rear, there’re five Gigabit network interfaces (LAN-1-LAN-4 and INTERNET), a USB 2.0 port and a power connection slot. 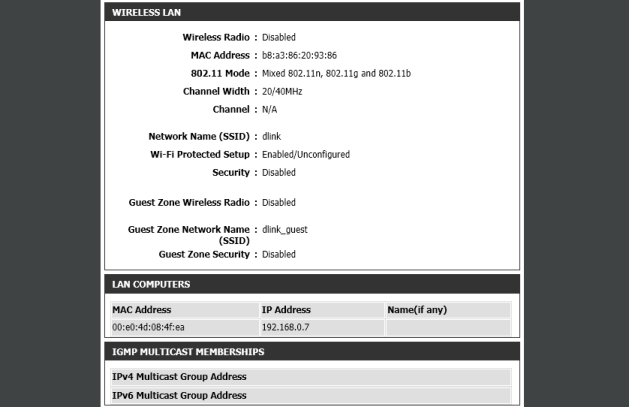 D-Link DIR-645 doesn’t have any external antennas. We couldn’t but disassemble DIR-645. Inside, we found two sets of green textolite boards. 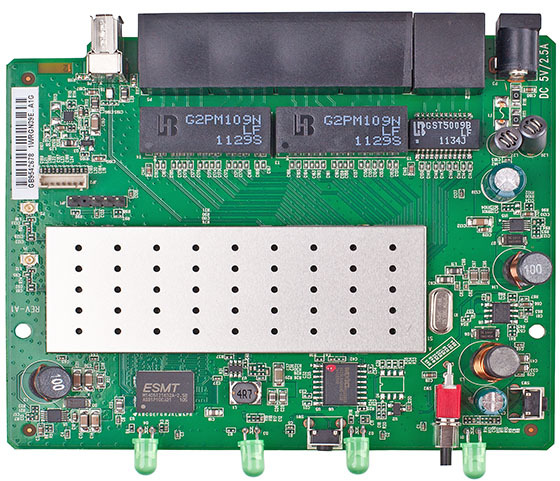 One board performs all functions traditional for a router, whereas the other four are responsible for beamforming. 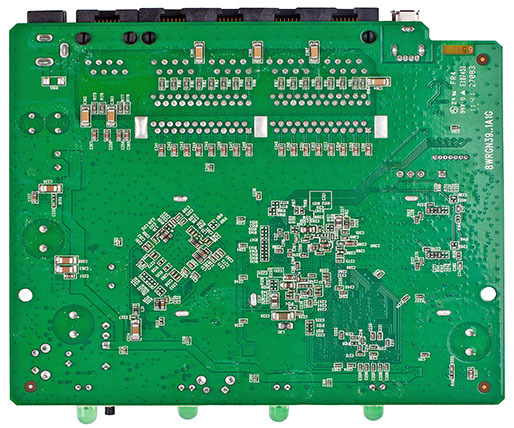 Unfortunately, most part of the intellectual components of the main board is hidden under a metal screen. Only a 64 Mbytes ESMT M14D5121632A RAM module remains outside. Now let’s see what the device software is capable of. 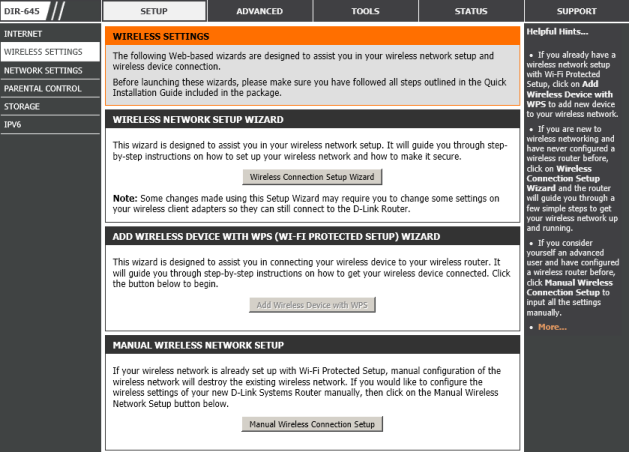 To perform initial configuration of the DIR-645 wireless router, the vendor recommends using special software that comes on a disc together with the device. 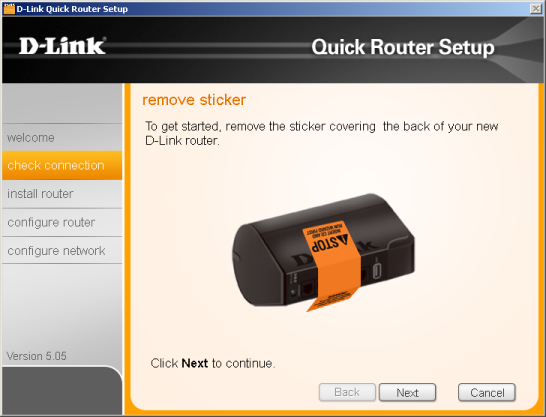 The D-Link Quick Router Setup utility allows detecting D-Link wireless equipment in the local network segment and gives users instructions how to connect the model correctly, asks to specify a new login and password for accessing the device, to set up the wireless network SSID as well as to perform a number of other actions. 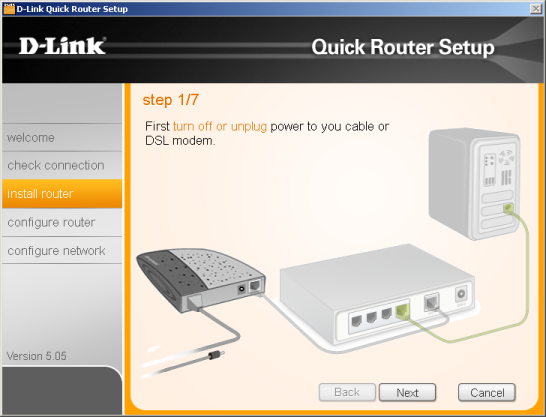 If D-Link DIR-645 is being installed in a new network, then devices connected to it will automatically get all necessary IP-parameters via DHCP, and the user will only have to turn to 192.168.0.1 in any modern browser and run the D-Link Setup Wizard to change the device main settings. 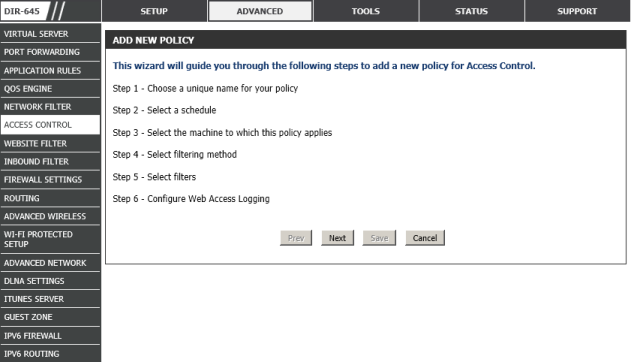 Naturally, the administrator can fully configure the device manually instead of running the wizard. 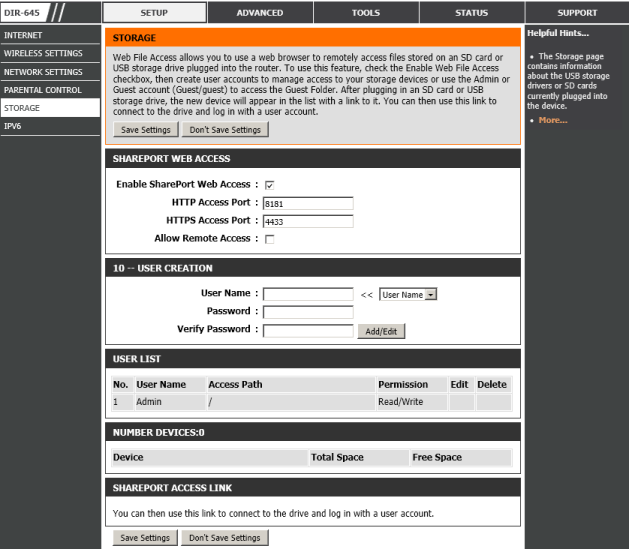 Besides the utility described above, the vendor produces another one – SharePort Plus with the help of which the administrator can detect remote hard drives, flash-cards, printers, scanners and multifunction devices in the network and connect them to the local computer. 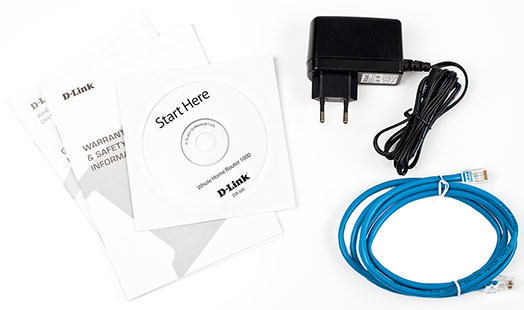 Naturally, these devices have to be equipped with a USB-interface and to be connected to D-Link network equipment placed in the local network segment. We reckon that adding a feature of remote connection of any device could be of use. 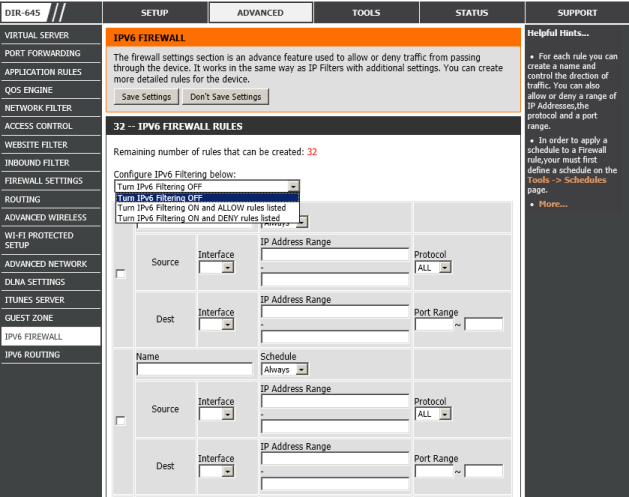 It’s worth saying that one can see the list of devices connected directly to DIR-645 with the help of the STORAGE item in the SETUP menu of the web-interface. 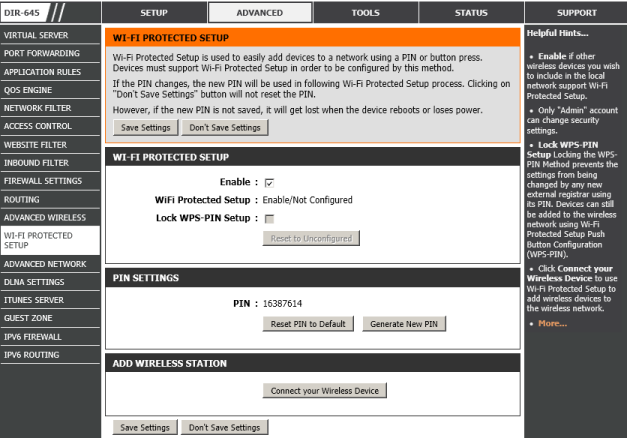 Although the process of firmware upgrade is not exactly part of preparing our wireless router to work, we still consider it a very important step necessary before performing any actions with the device. 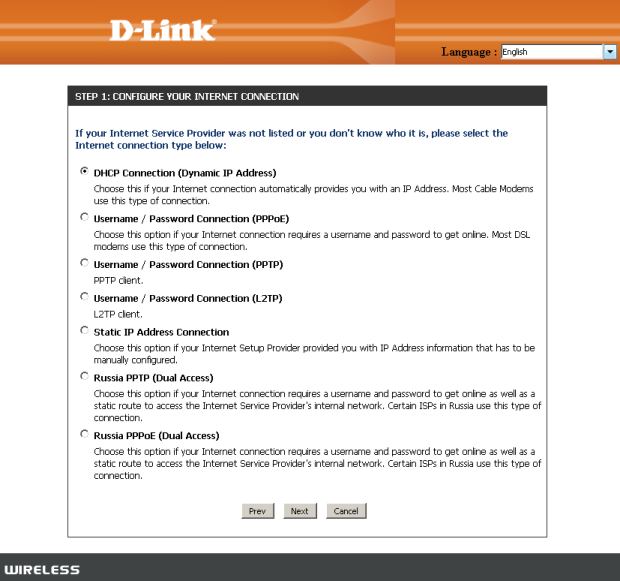 By default, the D-Link DIR-645 wireless router web-interface is only available in the English language (even in firmware version with the RU prefix). 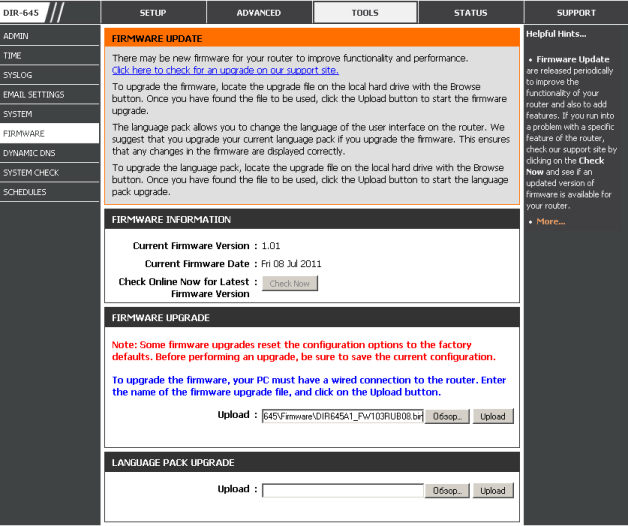 If one needs web-interface in a different language, he/she will have to install a language pack with the help of FIRMWARE item in the TOOLS menu. 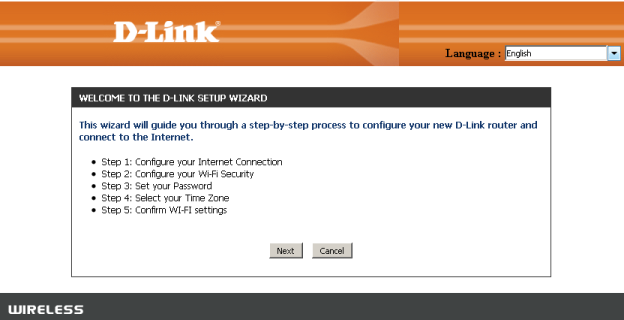 Unfortunately, when the article was being written, there were no language packs available for D-Link DIR-645. 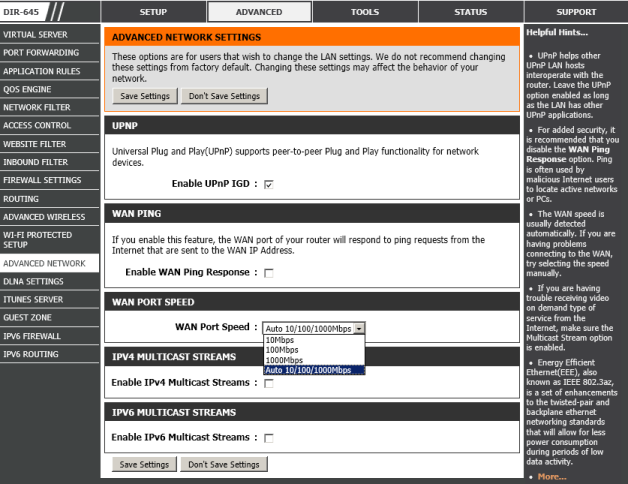 Firmware can be upgraded with the help of the same menu point; the user only has to choose a file with new firmware and wait for the router to reboot. The whole process takes about five minutes. It’s also worth noting that there’s a feature of semi-automatic firmware upgrade when the router goes to the vendor’s site by itself and downloads the file with the new firmware. Unfortunately, D-Link DIR-645 doesn’t have a crash mode, thus it won’t be possible to restore it with standard methods after a failure during firmware upgrade. Now let’s study the features of the device web-interface. 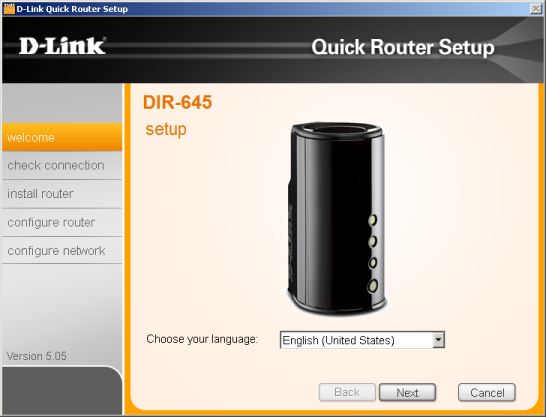 Access to the D-Link DIR-645 wireless router web-interface can be gained with the help of any modern browser; one only has to enter the device IP-address which is by default 192.168.0.1 and to specify a valid login and password. We would like to scrutinize the device web-interface so that in further reviews of D-Link equipment we could refer to this description. 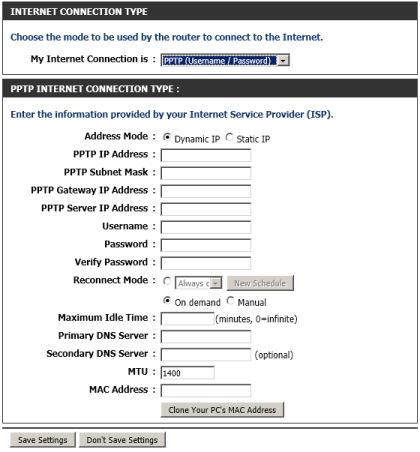 After entering correct account data the user gets to the INTERNET point of the SETUP menu where he or she can manually change the parameters of the device internet connection or just use a wizard for the same purpose. 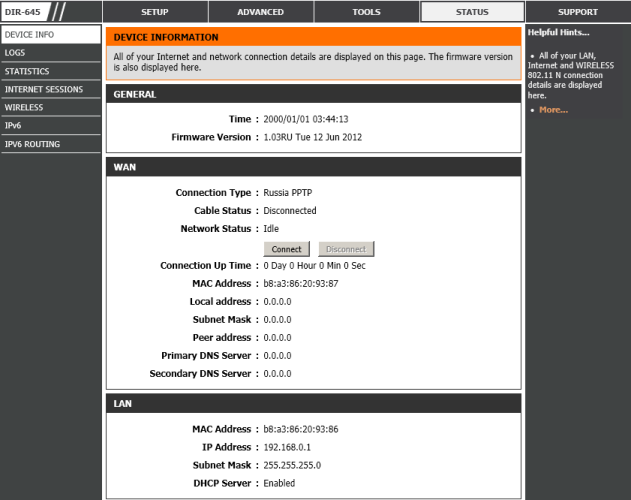 Unfortunately, we failed to set up a Cyrillic VPN-server, for instance, впн.провайдер.рф. 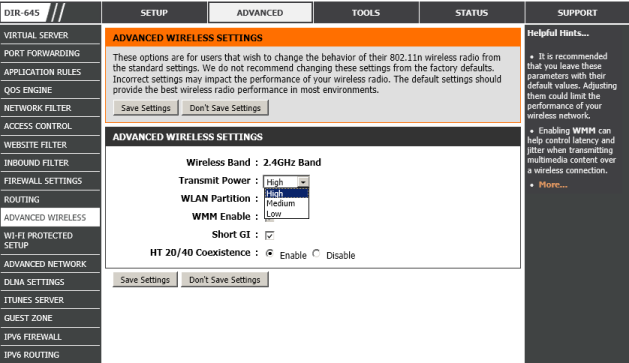 The WIRELESS SETTINGS item is intended for configuring (manually or with the help of a wizard) the parameters of the wireless module. 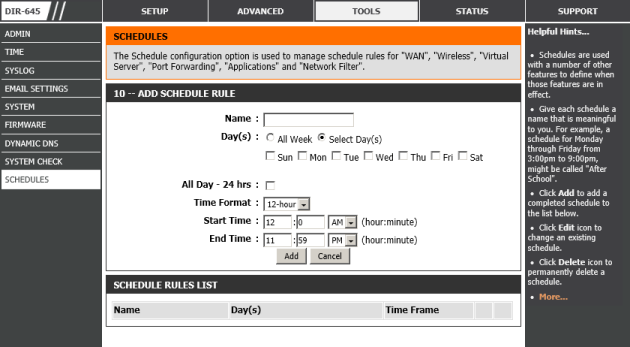 A nice feature of this router is that it’s possible to switch the wireless module on and off on schedule. 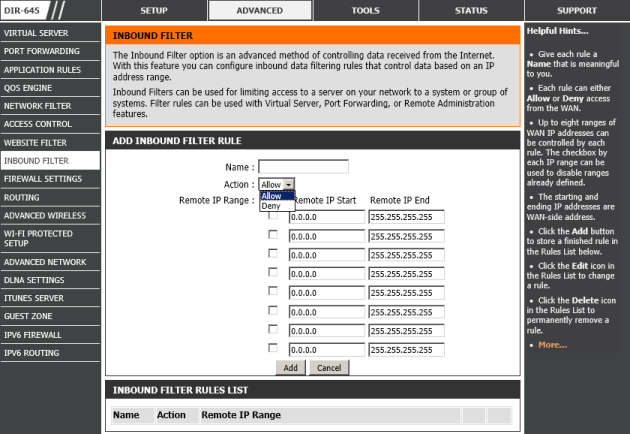 The LAN-interface is configured in the NETWORK SETTINGS point. 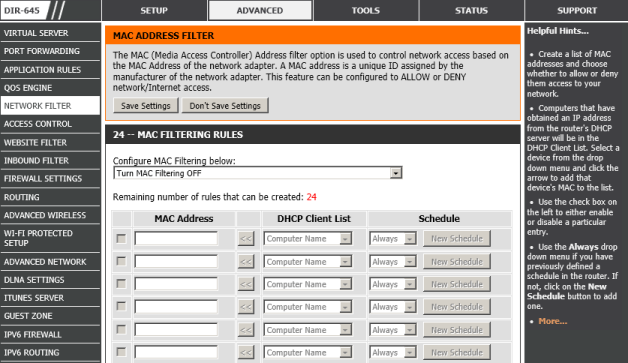 Here the administrator can also specify the parameter of a DHCP-server. 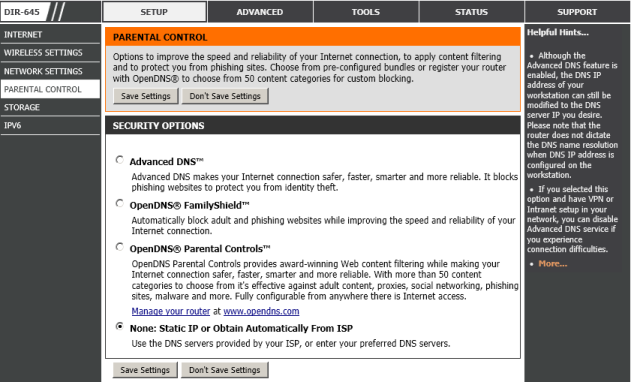 ThePARENTAL CONTROL point allows making the Global net slightly more secure for kids by restricting access to certain sites based on DNS services. Certainly, such service can’t prevent access to harmful content on legitimate sites but known felonious resources will be blocked completely. 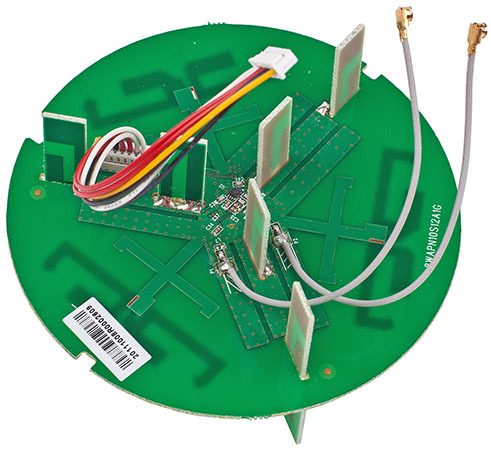 The USB 2.0 port located on the router rear panel can be used for connecting external hard drives or flash-cards; files there will be accessed via HTTP and NETBIOS. 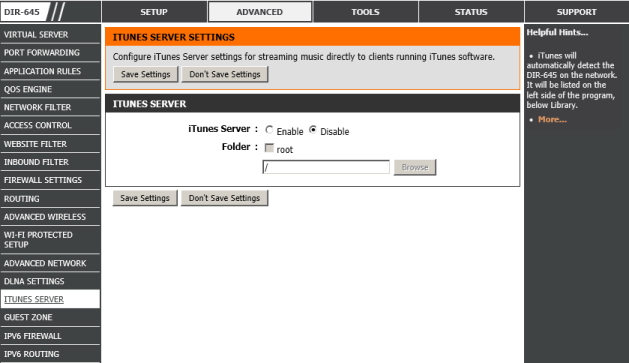 The corresponding settings are available in the STORAGE point. Addressing via HTTP the user is able to listen to music, watch video and photo-content and read documents. 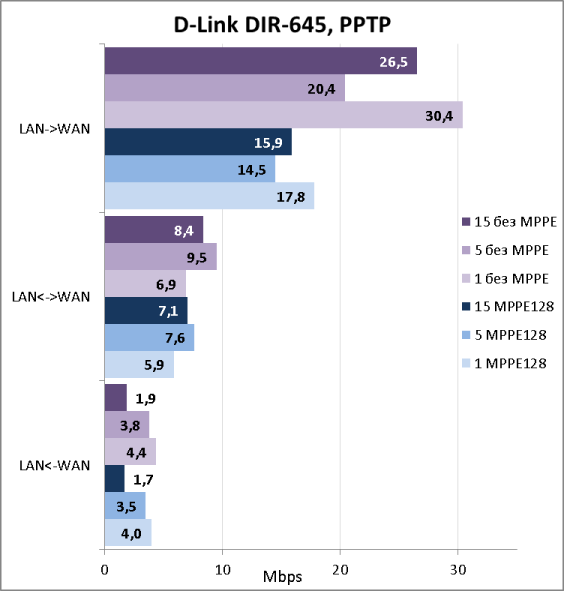 The D-Link DIR-645 wireless router supports IP of both version 4 and version 6. 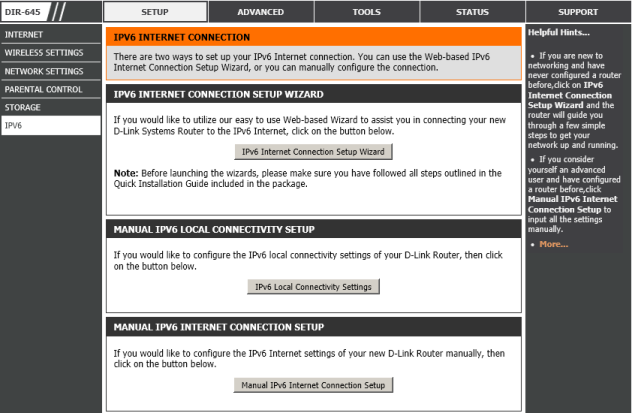 IPv6 is configured in the same-name menu point. 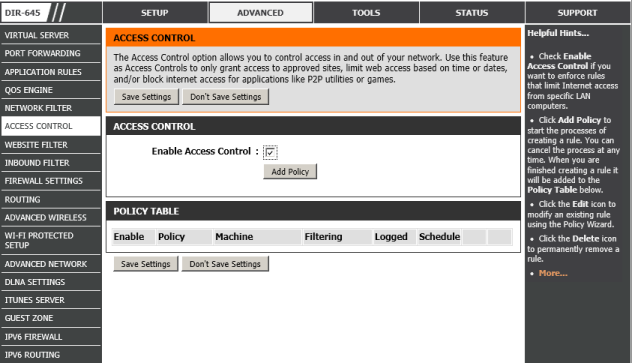 The VIRTUAL SERVER item of the ADVANCED menu allows the administrator to configure up to 24 virtual servers. 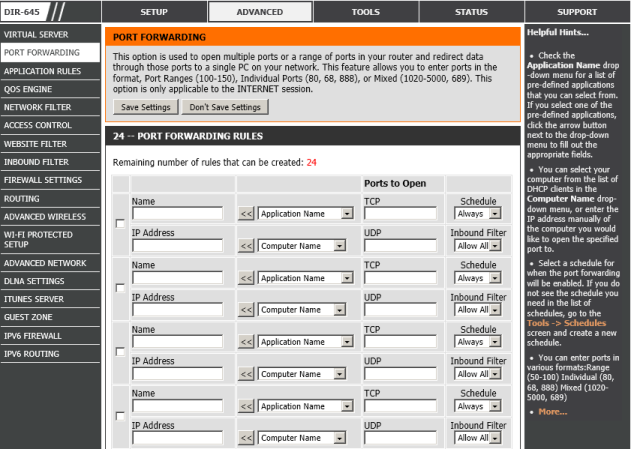 The PORT FORWARDING item serves the same point – there one can create up to 24 rules of port forwarding; however, in this case it’s impossible to change the number of a port. 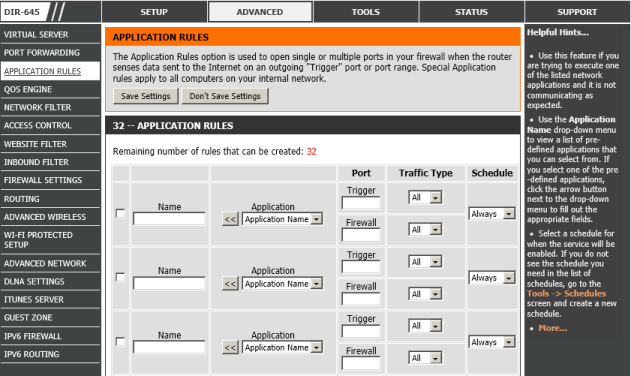 With the help of the APPLICATION RULES point the administrator can configure automatic data redirection for certain TCP or UDP ports to a node when some activity starts on a certain port. 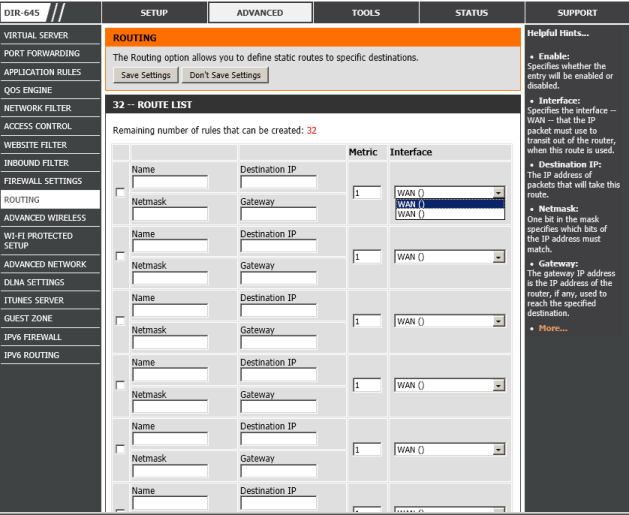 The quality of service parameters are configured with the help of the QOS ENGINE menu. 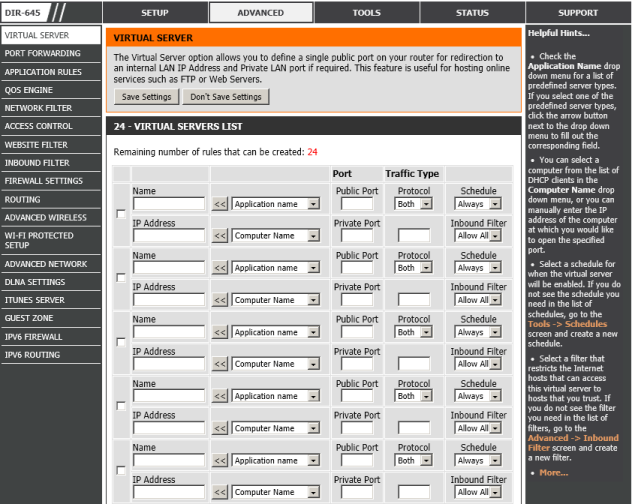 Here the administrator can assign each kind of traffic to one of four queues and then set bandwidth limitation for each of them. 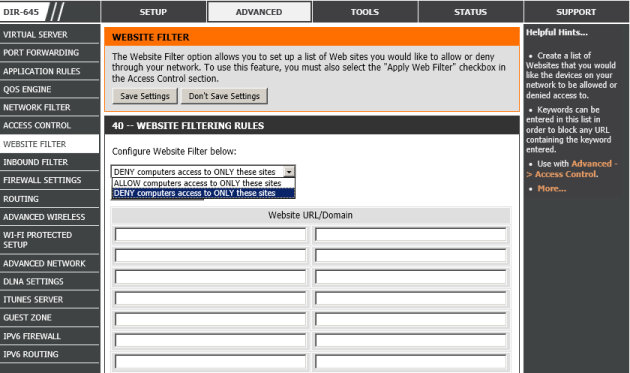 The NETWORK FILTER, ACCESS CONTROL, WEBSITE FILTER, INBOUND FILTER, FIREWALL SETTINGS, IPV6 FIREWALL and ADVANCED NETWORK menu points are intended for restricting access based on URL-, IP- and MAC-addresses. 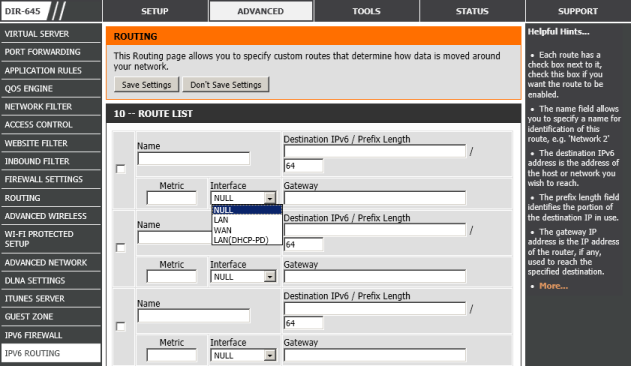 Static routing is configured with the help of the ROUTING and IPv6 ROUTING items. 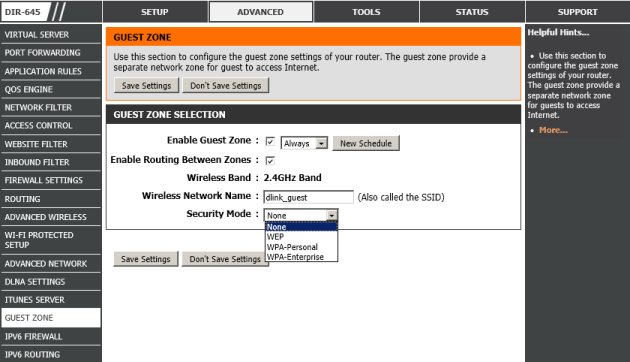 Wireless networks are managed with the help of the ADVANCED WIRELESS, WI-FI PROTECTED SETUP and GUEST ZONE points. Besides its main purpose of a wireless router D-Link DIR-645 can perform a number of multimedia functions that are configured in the DLNA SETTINGS and ITUNES SERVER points. 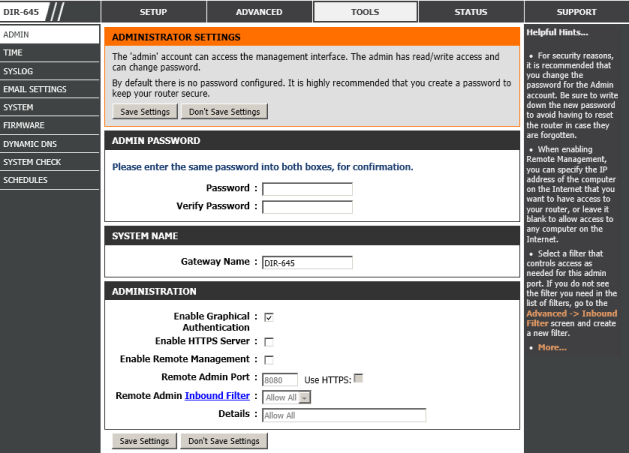 The ADMIN item of the TOOLS menu lets you change the administrator’s password and the device name; turn the HTTPS server on and configure the router remote management. 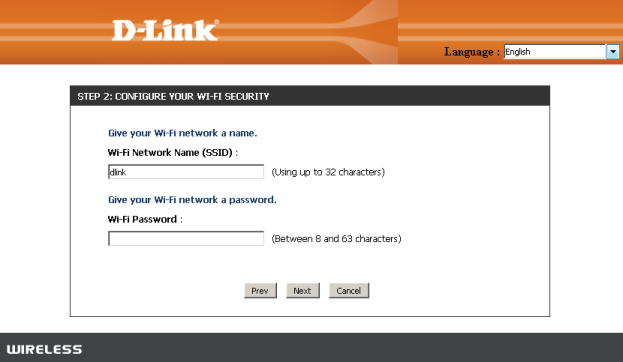 D-Link wireless devices have a built-in feature of graphic authentication protection against password attacks. 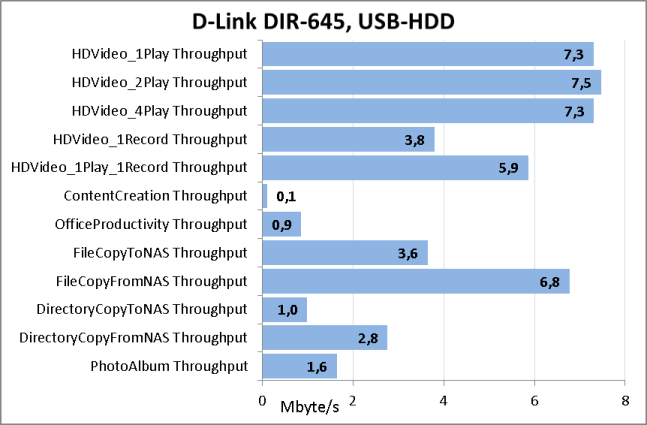 D-Link DIR-645 is no exception. The point of this function is that besides entering the administrator’s password, one has to type hidden text from a picture, which allows distinguishing authentication by a real user and automatic attempts to brute force account data. In some cases this function failed to work (rebooting didn’t help), which fully blocked access to the device; thus we would recommend using it with caution. 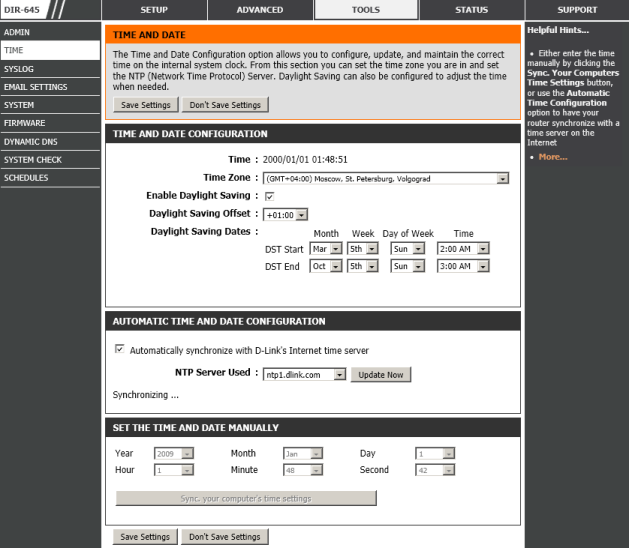 Everything to do with time (synchronization, choice of time zone and daylight saving time options) is configured in the TIME point. In the case of certain events the wireless router can send information about them either to the Syslog-server or by e-mail; corresponding configuration can be performed with the help of the SYSLOG and EMAIL SETTINGS items. 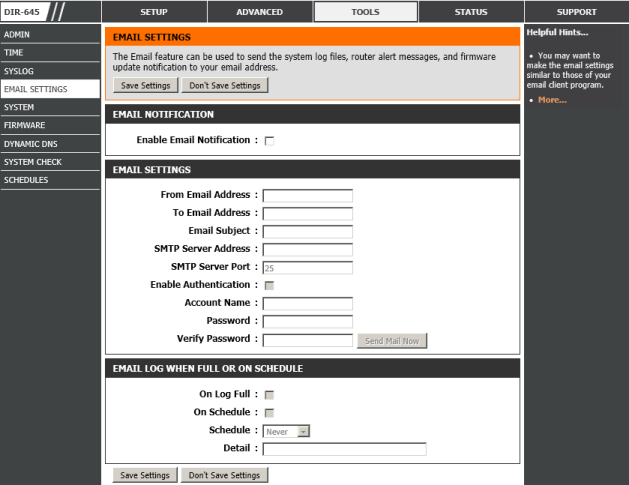 User settings are configured with the help of the SYSTEM point. Here the administrator can reboot the device and clear the language pack. 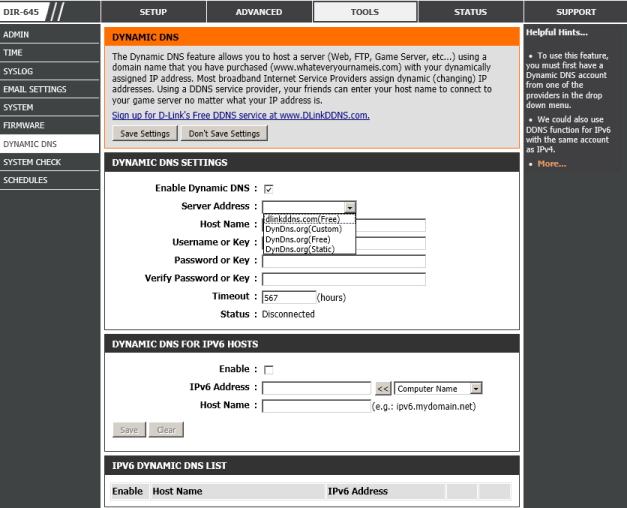 One can register on DDNS-servers in the DYNAMIC DNS menu. The SYSTEM CHECK point is intended for sending echo-requests via ICMPv4 and ICMPv6. Schedules are set up in the same name menu point. Items created here can be further used in other settings when it’s necessary to assign certain permitting or denying rules to certain time. 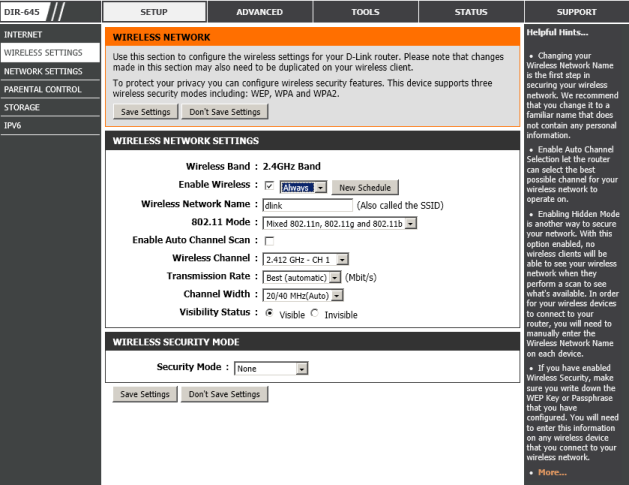 The STATUS menu gives the administrator information about the device status, log and statistical data, the list of current internet connections and connected wireless clients. 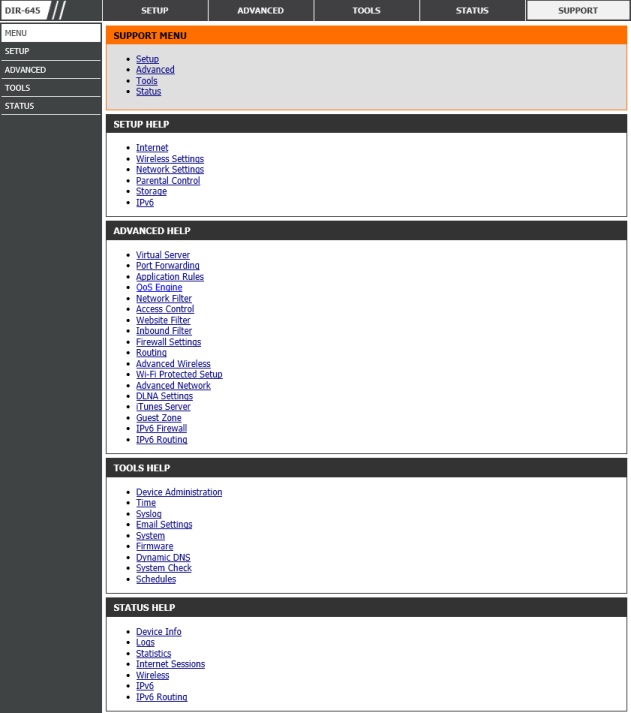 The SUPPORT menu is intended for providing reference information about the features of the tested model. Here we’re finishing this quite detailed review of the web-interface features of the wireless router D-Link DIR-645; now we’re moving on to testing the device. The first test we traditionally begin this section with is determining the device booting time under which we mean the time interval between switching the device on and receiving the first echo-reply via ICMP. 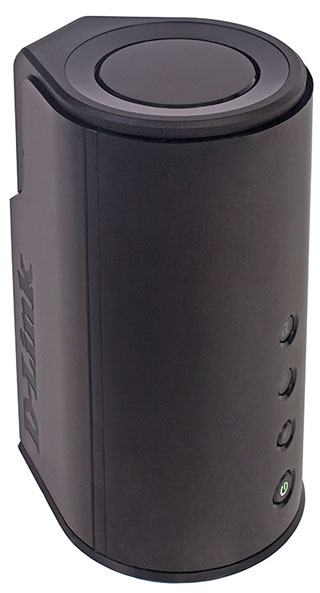 D-Link DIR-645 boots in 48 seconds. We think it to be an acceptable result. To check the device security we used the Positive Technologies XSpider utility version 7.7 (Demo build 3100). 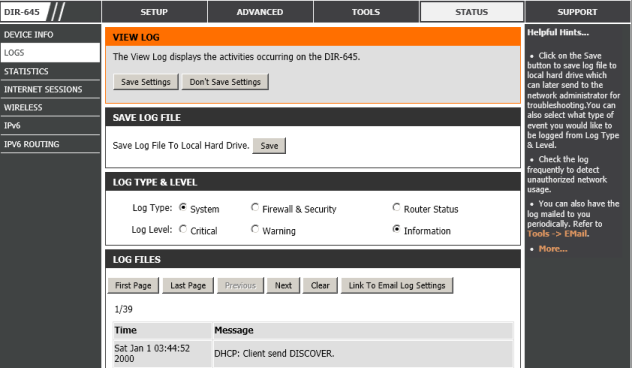 Scanning was run from the device LAN-interface. Altogether we detected eight open ports: TCP-23 (unavailable), TCP-53 (DNS), UDP-53 (DNS), TCP-80 (HTTP), TCP-8181 (HTTP), TCP-45555 (HTTP), TCP-49152 (HTTP) and TCP-63481 (unknown). The most interesting data we discovered during scanning are presented below. 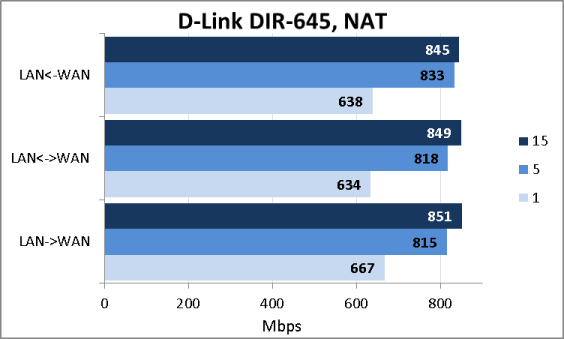 To test DIR-645 performance we used a testing stand the main parameters of which are presented below. First, we measured the wireless router performance in translation of network addresses (NAT/PAT) for one, five and fifteen simultaneous TCP-connections. 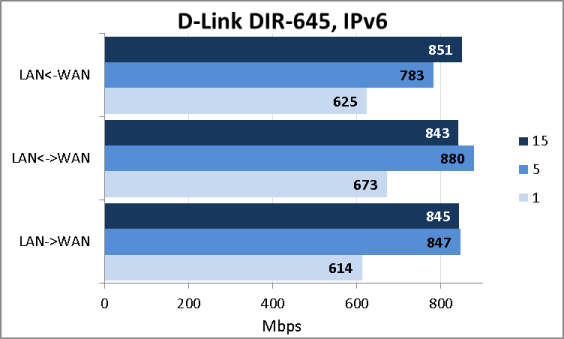 In our view, the speeds D-Link DIR-645 demonstrated in routing with translation are quite good for such a device. However, data transmission speeds via the PPTP-tunnel that we obtained is the next test were disappointing. 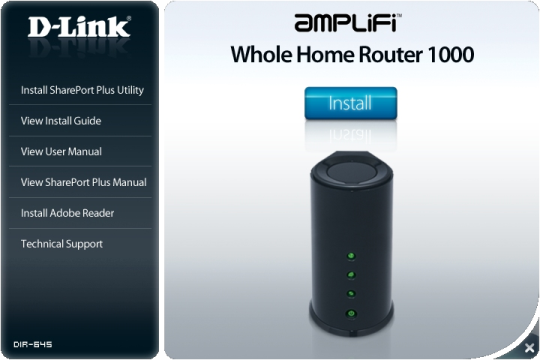 The tested wireless router supports these tunnels both with and without MPPE128 encryption. 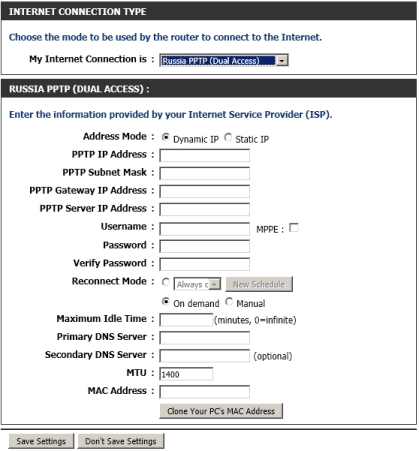 Only, to turn this encryption on, “Russia PPTP (Dual Access)” should be chosen as the connection type. 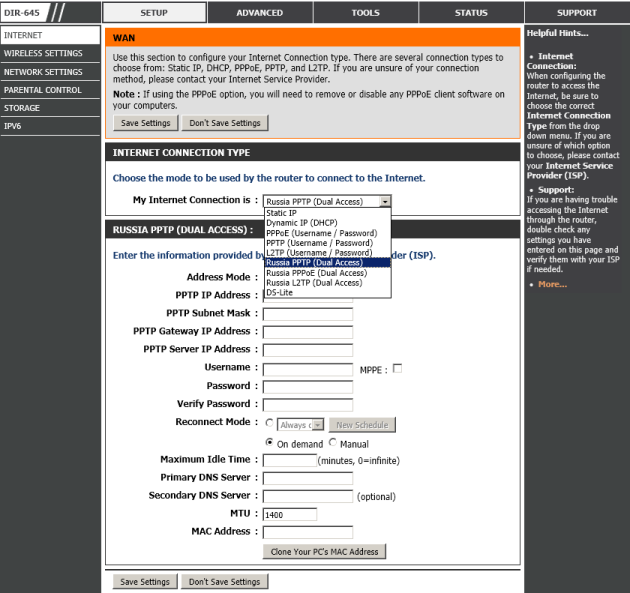 In future firmware versions the vendor is planning to increase routing speeds via PPTP. Moving further in testing the parameters of the wired network segment we measured routing speeds via IPv6 and obtained quite tolerable results for this IP version. However, testing simultaneous connections in both directions we found out that the WAN->LAN transmission speed (the red plot) is considerably higher than the LAN->WAN transmission rate (the yellow plot). The overall transmission speed in both directions is depicted in green. Also, we couldn’t leave aside the router wireless features. It’s worth noting that we were able to get the maximum connection speed (300 mbps) only after disabling the “HT 20/40 Coexistence” option in the ADVANCED WIRELESS item of the ADVANCED menu. The impossibility of using 40 MHz wireless channels can be also related to the presence of active wireless networks in the neighborhood; in this case the standard prohibits use of the neighboring channel, for which one may have to decrease the router power manually. The obtained transmission speeds in the wireless segment seem quite good; they’re presented on the diagram below. As D-Link DIR-645 has a USB-port, we couldn’t but connect our 750 Gbytes Transcend StoreJet 25M3 external hard drive to it and test the speed of accessing data on the disc. 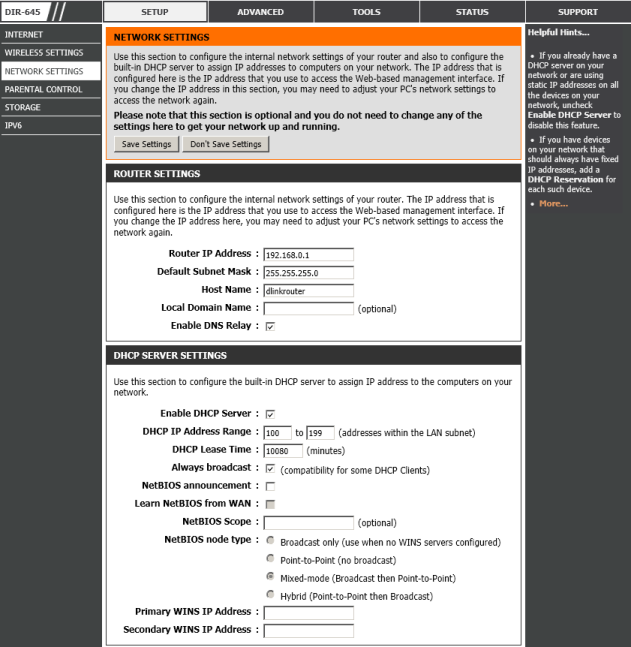 For this test we used the Intel NASPT utility version 1.7.1. The measurements results are below. 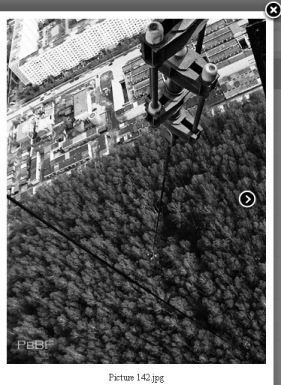 However, it took us quite a while to get the data above. After the beginning of the test we saw that the disc kept disconnecting from the router at random moments of time or DIR-645 itself rebooted or got hung up. For the sake of the experiment we decided to change the power adapter that comes together with the wireless router for the one we found in our lab. 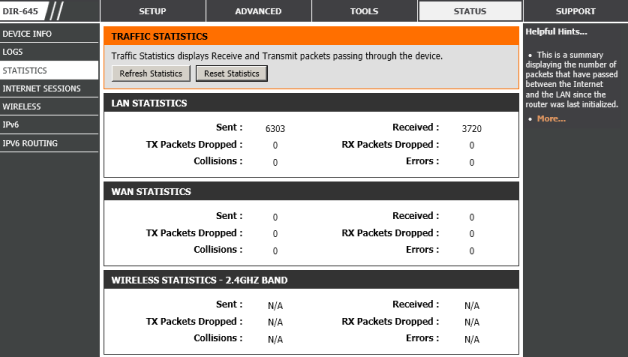 To our surprise, this action resulted in the router’s stable operation; we were finally able to finish our experiments. Here we’re through with the testing section and are moving on to making our conclusions. 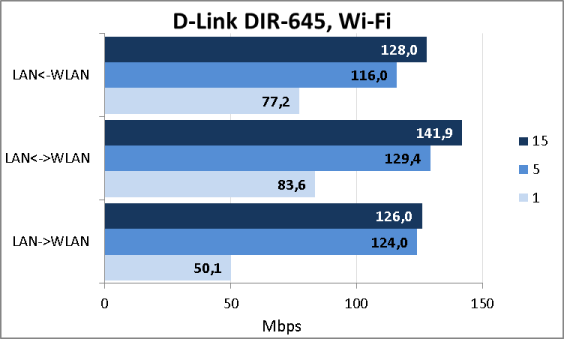 The D-Link DIR-645 wireless router we tested produced a mixed impression. On the one hand, it is a stylish and affordable SOHO-router with a wide range of features, among which good performance of regular routing for IPv4 and IPv6; on the other hand, low rates of data transmission speeds via PPTP are upsetting as well as unstable operation if the standard power adapter is used. The advantages of the device are listed below. Unfortunately, we can’t but mention the disadvantages, too. 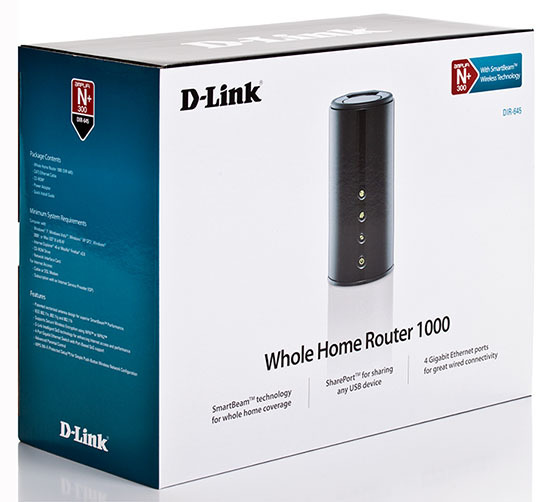 When the article was being written, the average price for the D-Link DIR-645 wireless router in Moscow online shops was 3100 RUB.